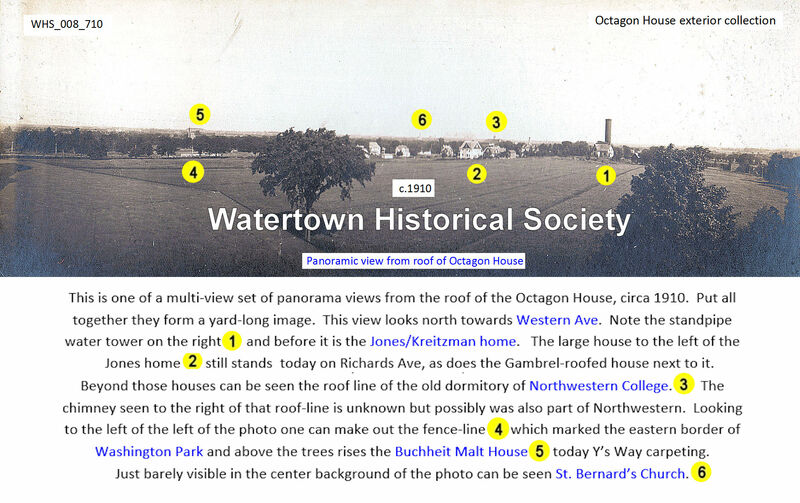 To many area residents the title "Watertown Historical Society" and "The Octagon House" are one and the same. In fact, they are at best interrelated, with one depending on the other. 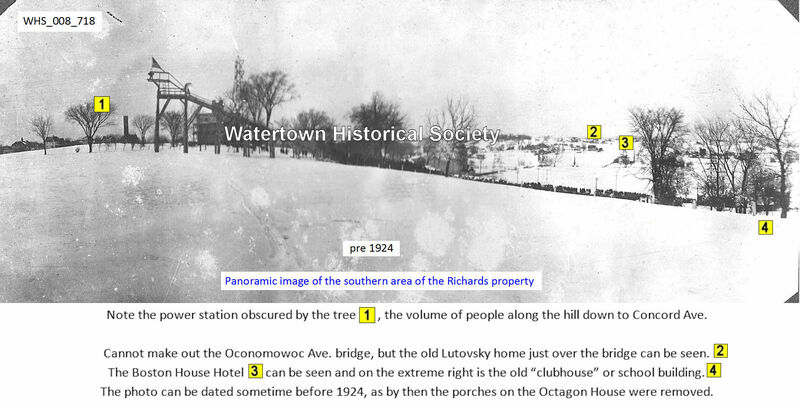 Richards arrived in Watertown, on foot, in the spring of 1837. Once here he became the first lawyer in Jefferson County, as well as the owner of several mills. In 1849 he married his sweetheart, the former Eliza Forbes. He promised to build her the finest home in the Wisconsin Territory if she would marry him. Its construction includes central heating, running water and ventilating systems. In addition to those "modern conveniences," the house features a central spiral staircase which rises from the first floor to the tower room. The Richards family and their descendants resided in the home until 1937, when grandson William Thomas passed away. 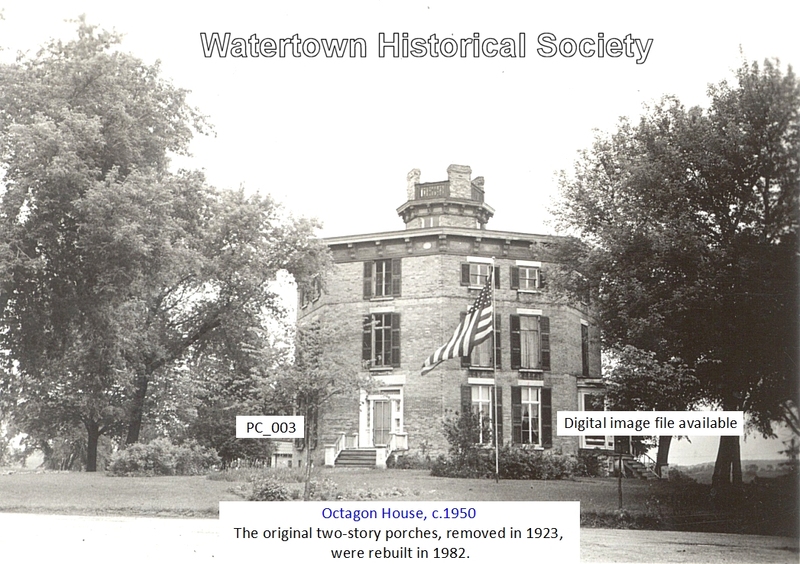 At that time the remaining family members were faced with what to do with the family home, which had become one of Watertown's' most recognizable landmarks. The Richards family offered to sell it to the city for $ 1, but opposition from the city council and several citizens prevented that from happening. 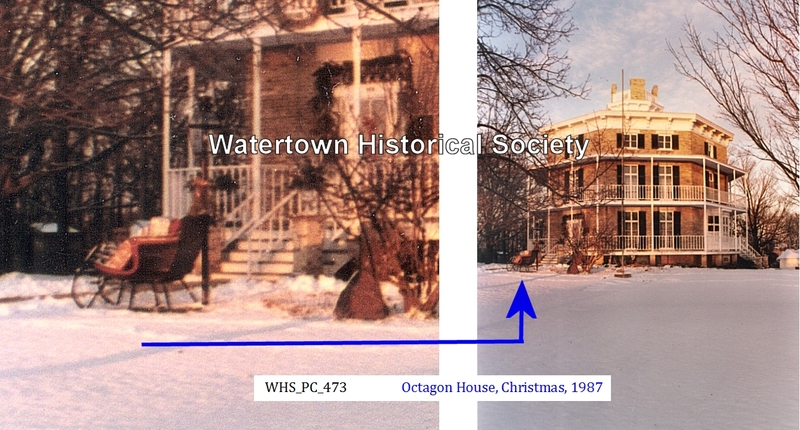 The fledgling Watertown Historical Society then came forward and arranged to purchase the home from the Richards family on condition that it always be used as a public museum. 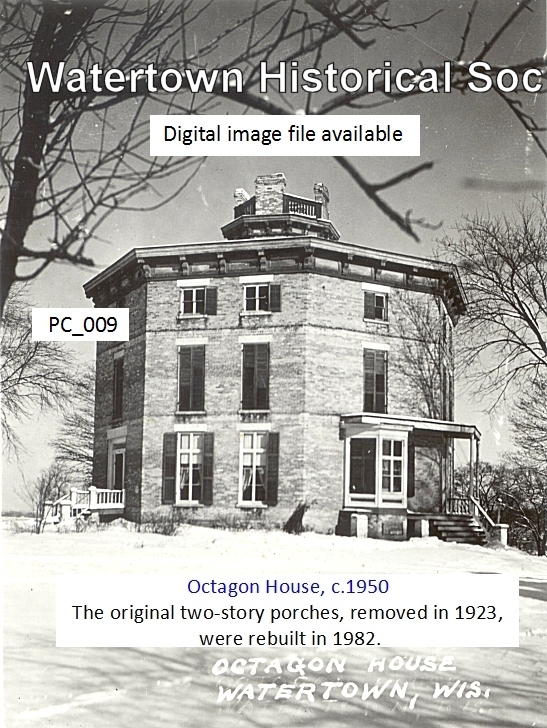 Since 1938 the Octagon House has been open to the public. John Richards, born in Hinsdale, Mass., in 1806, son of Revolutionary War forebears, graduated from Williams College and was admitted to the Massachusetts bar. He taught in a well-known school “Egremont” near where he lived, and later joined the trek across Midwestern states for adventure and homesteading in Wisconsin. The whole Northwest Territory was wide open for government land grants in the 1840's and 1850's and many young men from New England joined in the “go west, young man” [*] movement. Richards, while in college, had been influenced by a new concept in building that swept across America a few years later - the octagon shaped house. (The following article on Hon. 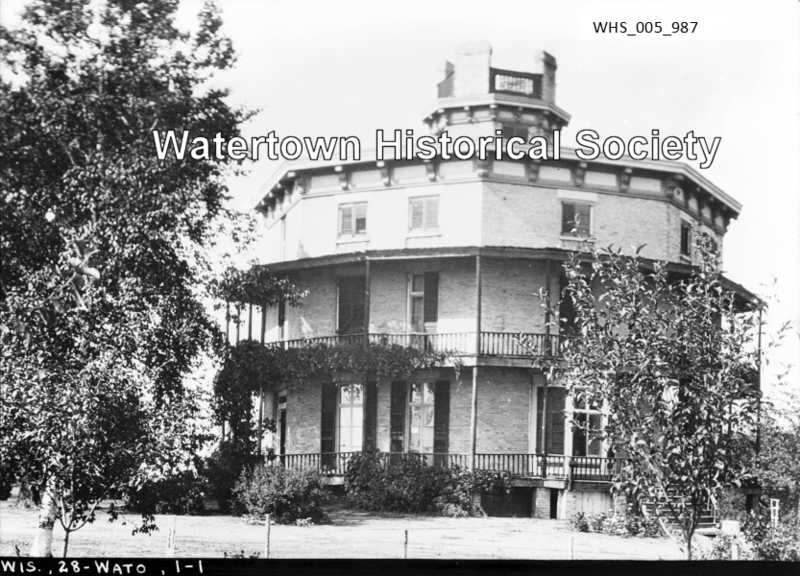 John Richards, builder of the famous Octagon House, was contributed by Hans D. Gaebler, president of the Watertown Historical Society.) 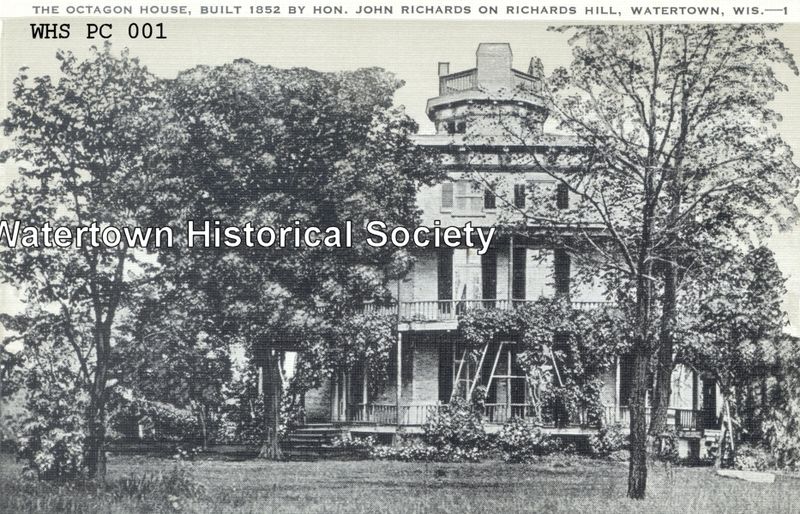 The name of John Richards, the man who built the Octagon House, appears in many of the early county records, and shows how varied were the activities of this pioneer citizen. Besides being one time mayor of our city and surveyor of the Plank Road, Mr. Richards was active in the earliest organization of Jefferson County. A court order of January 1840, on file at the county court house, records an allowance for services as district attorney and an even earlier record is a bond and oath signed by Mr. Richards, October 11, 1839, as justice of the peace. Richards and two companions came to Wisconsin in 1837, partly as the result of the financial panic of 1837 in the east. 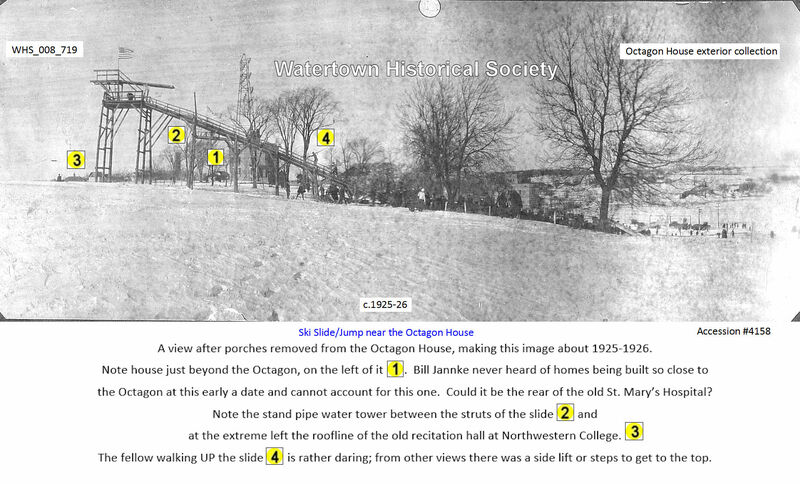 Watertown's first white man, Timothy Johnson, arrived shortly before that time. Richards walked and studied the areas in this part of the state and found exactly what he wanted in the navigable Rock River in Watertown. Good land was plentiful, there were hills and forests, but much work needed to clear trees and stumps. He bought farm land on the east side of the river and built a small log house. Some years later, in 1846, he completed the purchase of 140 acres of wooded land west of the river [*], including the high bluff which he had visualized as the site for the home he had in mind. This home would give him a commanding view of the Rock River valley. In 1840 Richards returned east to marry Miss Eliza Forbes of Great Barrington. Her father, Moses Forbes, was the owner of the Old Post Road stage coach line which ran between Hartford and Albany. To allay the fears of his bride for life as a pioneer in a new land Richards promised she would have the finest home in the area. There were friendly Indians around when Richards lived in Watertown - and timber wolves. In the Octagon House today is a rug made from the skins of four timber wolves and baskets and other artifacts given later to Mrs. Richards in exchange for loaves of her fresh bread. Richards and his bride began planning the fine home in the octagon shape. During this time Richards built a dam across the river and established a grist mill on the east bank. This flour mill burned in 1886. It was not rebuilt. Today the electric company power plant stands on the site of the former mill. 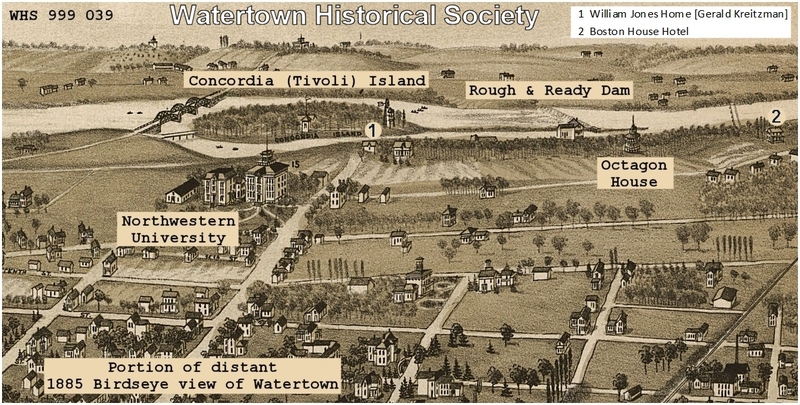 This was a time of prosperity for Watertown; its population grew from 1,500 in 1850 to 8,500 in 1855, making it the second sized city in Wisconsin. Richards milling operations made Richards increasingly wealthy and he decided it was time to build the large home for his family and build it of a size that would also take care of housing and feeding some of the mill hands or lumbermen he employed. The original Richards cabin was in an almost primeval forest but land was cleared and some rented out to others. 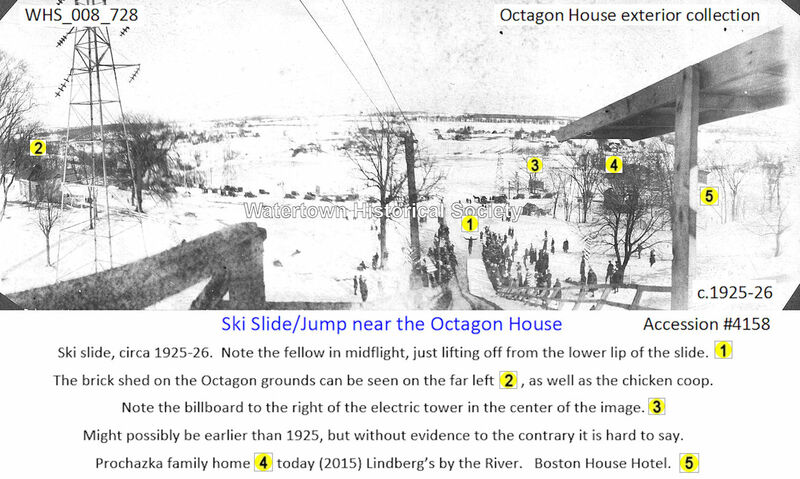 The Octagon House on the west side of the river was some years in the planning and three years under construction. In 1854 this beautiful home was completed and the family moved in. The original sketches and diagrams for the house made by John Richards are on display in the Octagon House today. Richards ran the mill, supervised the farm and did some law work. This pioneer lawyer did not actively set up a law office in Watertown, but did certain amounts of legal work when asked, He was the first district attorney in Jefferson County, helped set up a county system, was a member of the Watertown school board, was elected mayor in 1869-70, was also a one-time member of the Wisconsin legislature. He also engineered the construction of his dream home. 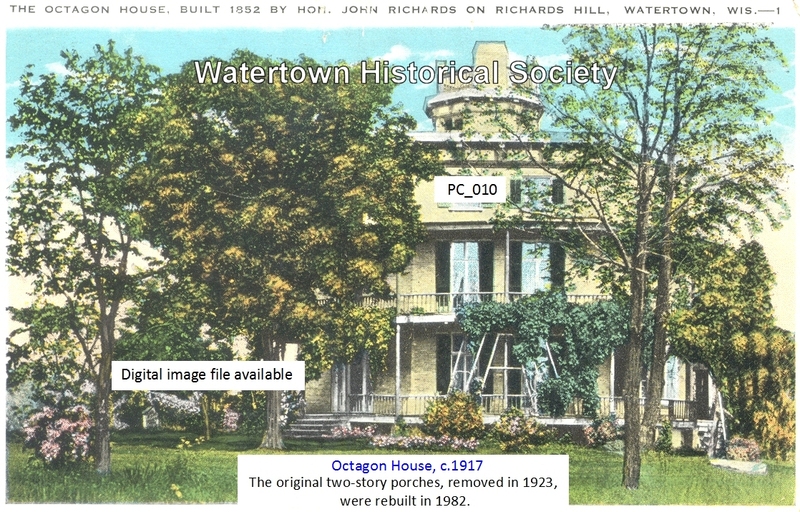 The Octagon House, the beautiful home built on Richards Hill in 1854, was owned and lived in by Mr. and Mrs. John Richards and their descendants until 1938 when the family presented this generous gift to the Watertown Historical Society. 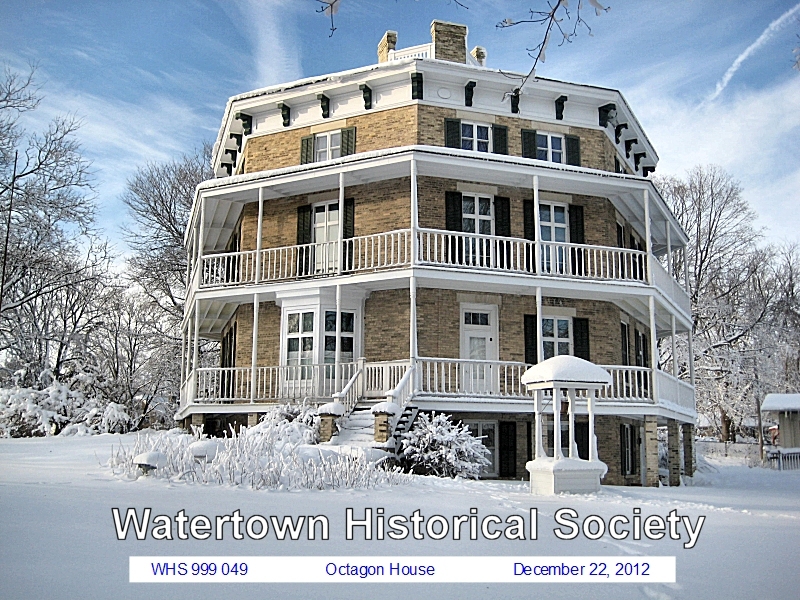 For the past 38 years the society has owned and maintained the home open to the public from May 1 to Nov. 1 each year. 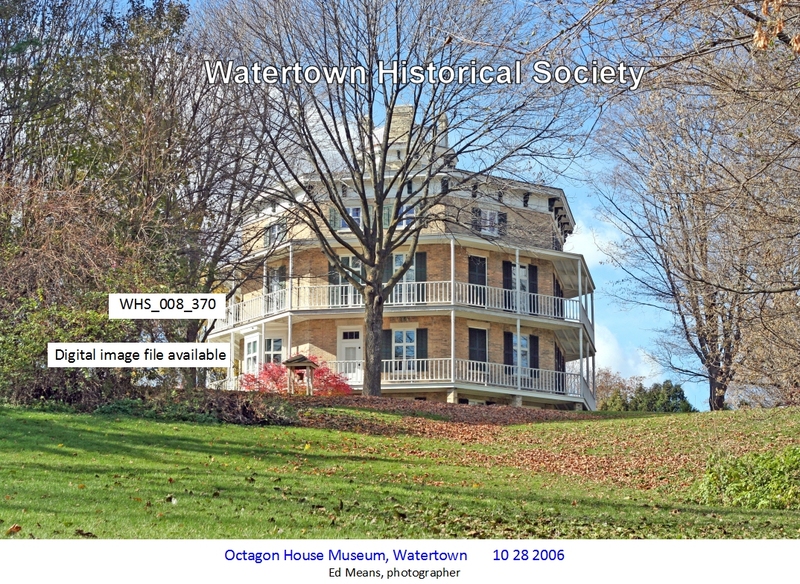 This Watertown landmark has lured thousands of visitors to what is probably the largest pre-Civil War single family dwelling in Wisconsin, a home with a unique place in Watertown history. "The Octagon House, a Home for All" by Orson S. Fowler, was published in 1848, although he had written individual articles on the subject earlier. Fowler, a phrenologist and publisher, had long been a writer on fresh attitudes toward living. “Nature's forms are mostly spherical," Fowler wrote, "Then why not apply this form to houses?" After publication of his Octagon House book many barns, houses, churches and schools in octagon shape sprang up, mostly in eastern United States. There are a number of octagon shaped barns in this area in Ozaukee (WI) County. By 1857 at least 1,000 such houses had been built throughout the country. Fowler believed the octagon shape, which approximates a circle, provided the greatest utilization of space. John Richards, a typical down east Yankee and a man of many talents, was also a visionary and agreed with this principle of a home in octagon shape. The house was the talk of the town when it was built, and Richards took great pride in the house and the many innovative features he had installed. The perfect octagon measures 50x50 feet in any direction and sets on a 17- inch foundation entirely beneath the ground. While most housing designs are based on rectangular shapes, there are some homes with an unusual eight-sided floor plan. These octagonal houses have been turning heads for more than 150 years. The concept of the octagonal house was idealized by Orson Squire Fowler in his 1853 book "A Home for All: Or a New, Cheap, Convenient and Superior Mode of Building." Fowler, a phrenologist who deciphered the contours and bumps on the human skull, advocated octagonal-shaped buildings because the walls of an octagon enclose more area than a square or rectangle with equal wall space. Fowler reasoned octagon houses were cheaper to build, eliminated dark corners, were easier to heat and remained cooler in summer. Three courses or rounds of brick form the 13-inch walls; the inner two rounds are Watertown brick from the local and newly established brick yards which began work in Watertown in 1847. The outside brick layer was Cream City brick hauled from Milwaukee by ox and horse teams over the new plank road. Most of the lumber, basswood, cherry and oak came from the Richards woods. Some pine was used. This had been floated down the river and was prepared in the Richards mill. The large three-story home, plus basement and windowed cupola, has 57 rooms counting halls and closets. The main rooms are square, the corner rooms used for children's or sewing rooms. The original house had narrow verandas which encircled the house on the first and second levels. When they became unsafe they were removed. A good sized replica of the Octagon House, with the porches, is on the grounds to show visitors the original design. The first floor rooms, a music room, living room, dining room, butlery and conservatory are 10 feet, 10 inches in height. A dumb waiter functions between the dining room and kitchen in the basement level, and a large chest of drawers was built into the south wall of the dining room for linens and storage. Large family bedrooms with accompanying small corner rooms for the small children are on the second floor. The ceilings at this level are 9 feet, 9 inches. The third floor had been added to Richards' original design in order to accommodate the young men who worked in his mill. Above the third floor is the sizeable cupola with chimneys extending from the corners. The third floor ceiling slopes toward the center to follow the pitch of the roof line. This slope is necessary to take care of one of one of the most unusual features of the house - a system for running water. An over 12x6 foot size wooden water tank made of basswood and lined with zinc is suspended above the floor. The tank held rain water which flowed in from the funnel-shaped roof. This water was then diverted to faucets on both the second and third floor stair landings, to the kitchen, to a basement cistern and the run-off drained to the bottom of the hill toward the river. Light which comes through the cupola windows falls on the spiral cantilevered hanging staircase, with its hand molded cherry rail, the work of skilled artisans of well over a century ago. The stair, known to be one of the few of its kind in the country, is unsupported on one side but securely anchored into the brick walls in the stairwell so that there is not a creak after the many years since its construction. Richards built a form of air conditioning into his home with louvers that opened at night to trap the cool air, circulated it throughout the walls, and the louvers closed during the heat of the day. Much of the work and time of the household centered in the basement level, where there was the kitchen, a cider room, vegetable room, cistern, pantry, wood storage and furnace room. A large Dutch oven in which 24 loaves of bread were baked at a time helped feed both the family and the mill hands. A furnace capable of heating all these stories in the house burned as much as a cord of wood a day. Exit from the basement level is on the ground level in back; the lower hall is paved with bricks. Authentic furnishings and artifacts of the Richards' era are in the Octagon House. Much of the furniture was family furniture presented to the Historical Society with the home. The first piano brought to Wisconsin, a Gilbert square, was purchased by Richards for the music room. The dining room furniture belonged to the Richards family and some fine pieces were donated by the John W. Cole family. Certain rugs, curtains and other pieces had to be replaced throughout the years but were carefully selected from the same period. The dining room windows have always had wide white window shades trimmed by hand. Original kerosene chandeliers hang in the downstairs room and in the Richards bedroom on the second floor. Second floor rooms were bedrooms and contained a replica of the Lincoln bed, the same as used in Lincoln's home in Springfield, IL, and in the Richards' bedroom one can view the cannonball bed, so called because of its interesting construction. There is also the child's cradle made by Richards. Bunks like those used by the mill hands are along the wall of a third floor bedroom. Also in the room is an old fashioned zinc lined bathtub and articles used by the mill hands for entertainment in their off hours. These men, in addition to working in the mill, frequently floated logs down the Rock River. Kitchen cupboards hold many cooking utensils used by Mrs. Richards. The old fashioned wood range is located near the Dutch oven. In short, the home shows authentic articles of daily living used or typical of being used during the over 80 years the family occupied the home. Both John Richards and Mrs. Richards were hospitable people. Many old letters in the files attest to this hospitality. Richards was big hearted and generous and never denied his family anything. His bookkeeping system, however, left something to be desired. He kept no accounts, marked sales and money due him on a handy shingle or forgot the transaction entirely. Mrs. Richards found this difficult after he died when she took over management of the farm and found no record of back debts listed for her to collect, though she knew there were many. The couple had eight children, five of whom lived to adulthood in the Octagon Home; Anna Richards Thomas, Alice Richards Green, Moses Richards, Willie Richards and Charles Richards. John Richards died in 1874. Mrs. Richards in 1902. Their daughter, Mrs. Thomas, lived in the big home until 1936 when she died at the age of 94. Her son, Willie, died the next year. 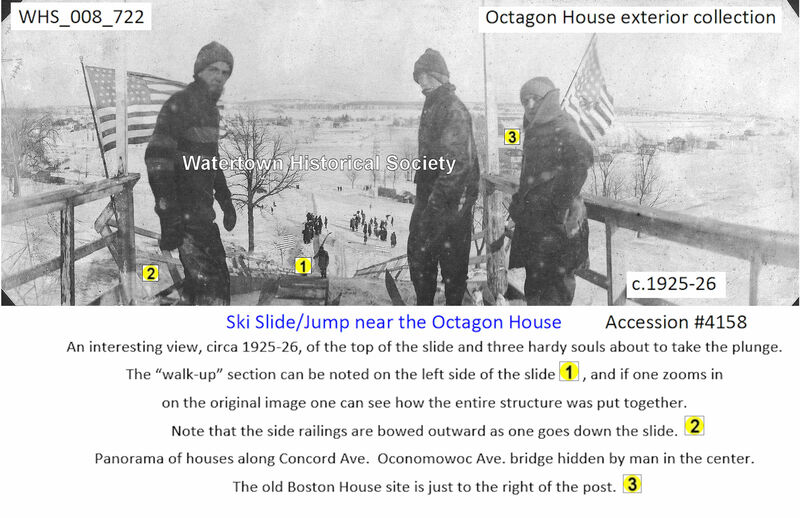 He was the last family occupant of the Octagon House. 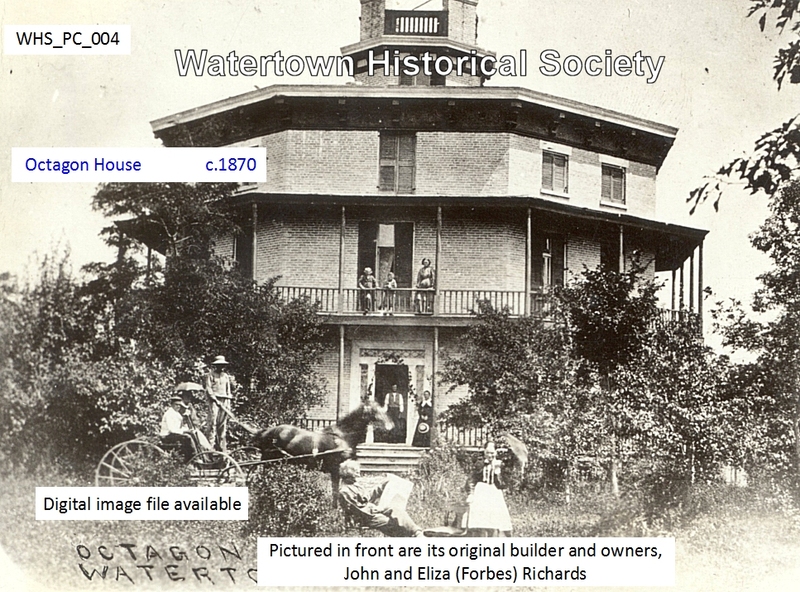 In 1938 Estelle Bennett Richards, widow of Charles Richards, the youngest Richards son, signed the deed which turned over ownership of the home to the Watertown Historical Society with the condition that in the future the house be open to the public at stated times. There had been desire on the part of Mrs. John Richards that the family do something for Watertown with the house, and this plan was followed through by her family. Harvey Richards, a son of Estelle Bennett Richards and Charles Richards, and grandson of the original builder, John Richards, worked with G. H. Lehrkind, Historical Society president in 1938, and Attorney Wallace Thauer to transfer title of the property. 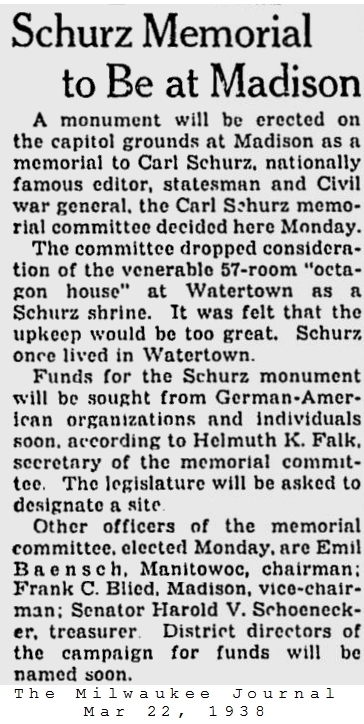 Hans Gaebler, a real historian and most interested in the preservation of historic sites, was in many ways responsible for organization of the Watertown Historical Society. 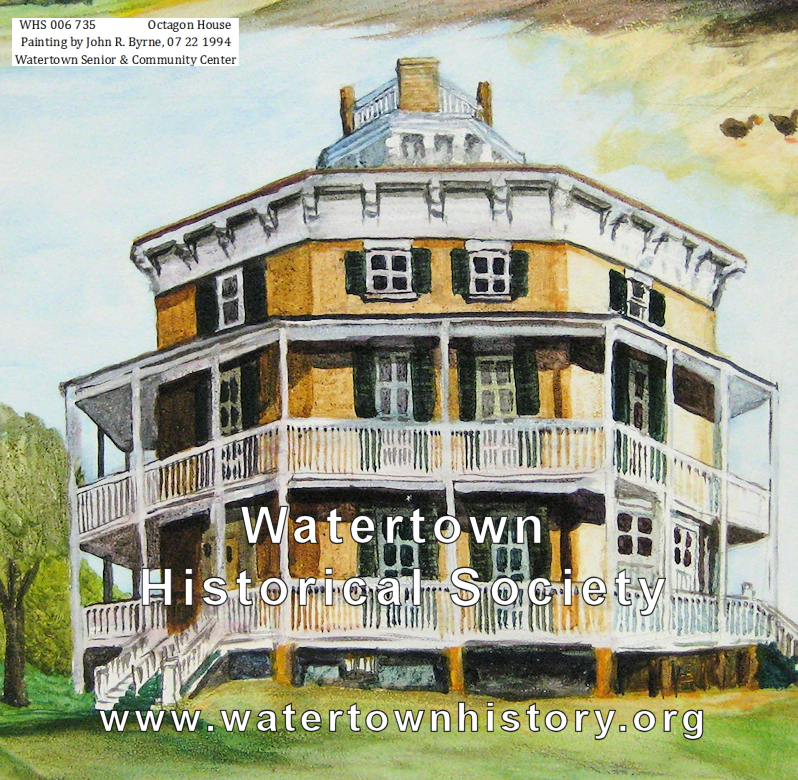 The Articles of Incorporation for the Watertown Historical Society were signed in 1933 by John D. Clifford and Jane Lord, two of the charter members. Other charter members were Mrs. G. C. Lewis, Tom Lewis, William Thomas, Claire Herrman and Gladys Mollart. Persons who greatly helped put the new society on its feet and helped with much of the original planning were, in addition to the above, Mrs. Lydia Wiggenhorn, Mrs. Dan Thauer, Mrs. Eli Fischer, Sidney Northrop, Prof. E. C. Kiessling, Dr. A. C. Hahn, James Anderson, Marcella Killian and Miss Ella Wilder. As of 1976 five men had served as president of the Historical Society: Hans Gaebler, G. H. Lehrkind, Dr. Oscar Meyer, Byron Wackett, Lee Block and Fred Kehl. There had been two curators to that date: Mrs. G. C. Lewis, 1939 to 1945 and Gladys Mollart, who served since 1945. Three buildings have been added on the Octagon House grounds since the Historical Society was presented with the house. The first American kindergarten, founded by Mrs. Carl Schurz in 1856, was moved from its former location at 2nd & Jones streets. A pioneer barn was moved from the east side of Watertown, where it stood at one end of the Plank Road as the toll house, to the Octagon grounds, and a new building, the Gladys Mollart tour center, was completed in 1969 and dedicated to Miss Mollart. 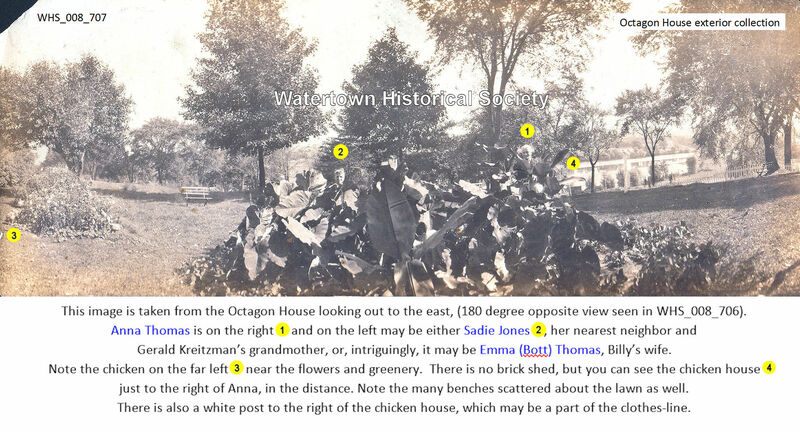 In addition to the buildings much help has been received in landscaping the grounds and many symbols of Watertown's past have been donated to the Society for preservation of some of Watertown's early history. During many years the Octagon Garden club has planted and tended an old fashioned herb garden just outside the kitchen door. The bronze bell from Watertown’s first city hall, dated 1869. The fountain statue Phillis, originally given to the city by Mrs. Carrie Mowder Hill but presented to the Historical Society when the new city hall was built. The anvil used by the A. Kramp Company for 115 years for pounding out horse shoes or steel tires or rims for the wagon wheels for the army quartermasters corps, presented to the Society in 1972 by Leonard Kramp. The historic old green trunk marked for Margarethe Meyer Schurz “via Frankfurt, M. Bremen Nach New York America" ended its travels in the room in which she taught, presented by Mrs. Gerald Fahl, through her child's kindergarten class in Oconomowoc, after she found it at a farm auction. A cobbler's bench from the first shoe factory Fridolin Ruesch began in the 1850’s and operated by that family for several generations, presented by Mrs. Dean Lawrence. The Indian which adorned Watertown's West Main Street in the late 1880's. A large heavy "Buhrstone" mill wheel ordered from France in 1878 and used by the Empire, later the Globe Milling Co., presented by the Floyd Burnetts, last owners of the property on which the mill wheel had been mounted. An early beehive and slatted wooded crate manufactured by G. B. Lewis Co., the bread box made to ship food to American troops in World War I, thousands of miles from home base. Mathilde Schley painting of the House is preserved in the museum. The name of John Richards, the man who built the Octagon House, appears in many of the early county records, and shows how varied were the activities of this pioneer citizen. In case this may meet the eye of the person whom it may concern, that person (and in once and a half trying I can guess who it is) is most sincerely invited to return the bags taken out of my grainry [granary] one night last week. The wheat and oats I don’t ask for, but the bags I need very much, they having been all I had. JOHN RICHARDS, Watertown, June 4, 1849. 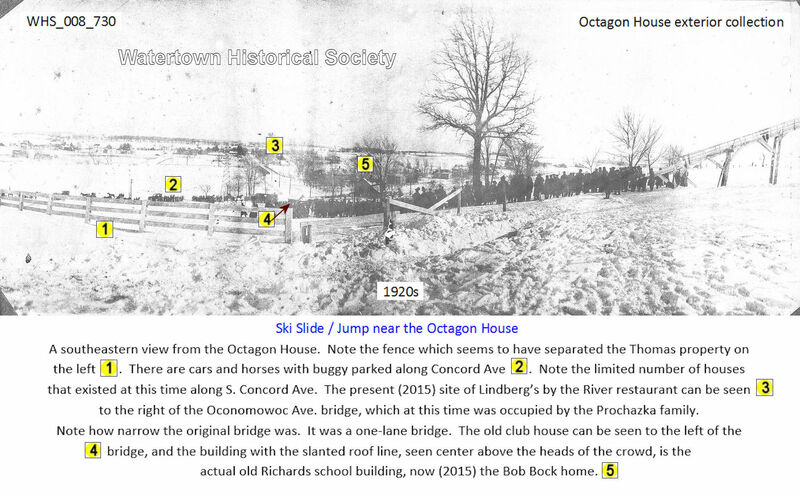 CROSS REFERENCE NOTE: The John Richards lived in a log cabin prior to the construction of Octagon House. The house was some years in the planning and three years under construction. In 1854 this beautiful home was completed and the family moved in. John Richards Esq., informs us that the foundation for an oil mill is laid, near the Rough & Ready Mills, and that the building will be pushed forward, so to be ready to purchase the crop of the coming season. We are glad to see this enterprise under way, as we are satisfied that it will prove profitable to the farmers and all concerned. - Watertown Democratic State Register. CROSS REFERENCE NOTE: John Richards has a saw mill and oil mill or turning shop on the east side (of the river). [Source: City of Watertown, Wisconsin, Its Manufacturing & Rail Road Advantages and Business Statistics, 1856, published by order of Watertown City Council]. Oil mill produced linseed oil. Linseed oil, extracted from flax seed, is used as a preservative for wood and an ingredient in paints, varnishes, and stains. Also used in soaps, inks, and in the production of linoleum (the first three letters of linoleum are lin... for linseed). Rough & Ready dam (the upper dam) was built in 1847. 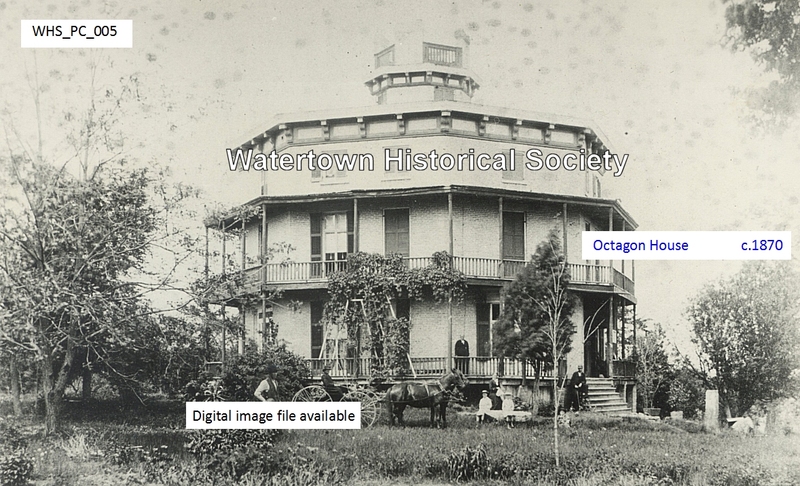 Watertown's Octagon House was built by pioneer settler John Richards and completed in 1854. 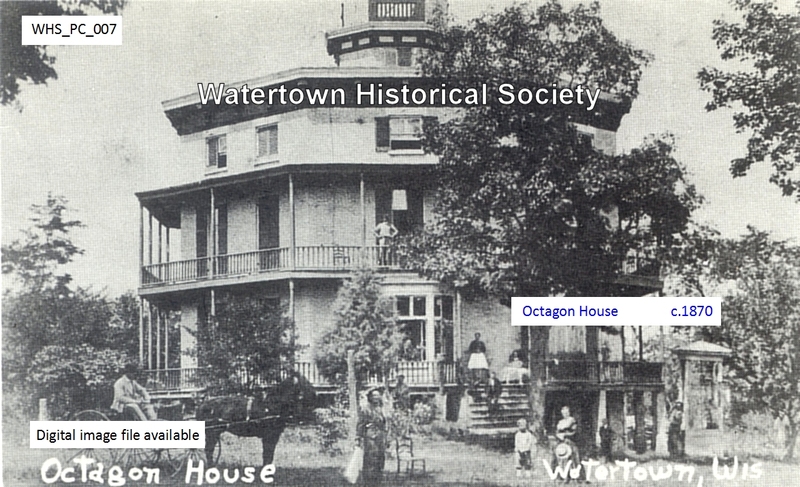 The Octagon House was one of the largest homes built prior to the Civil War in Wisconsin. Its only occupants have been members of the Richards family. Following the passing of Anna Richards Thomas in 1936, the mansion was donated in 1938 to the Watertown Historical Society. John Richards built the Cass Green house at the time of his daughter Mary Alice's marriage to Lewis Cass Green. Alice Green and Anna Thomas; the others are unknown but most likely Green family members, Alice’s children and grandchildren. 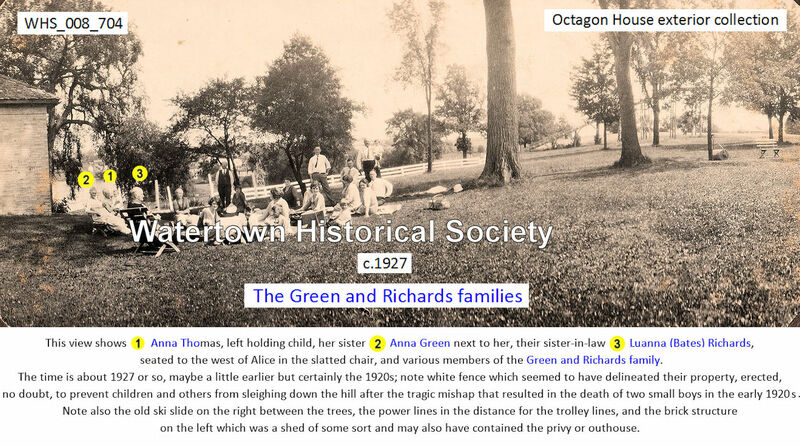 Anna Thomas, her sister Anna Green, their sister-in-law Luanna (Bates) Richards, and various members of the Green and Richards family. William “Billy” Thomas with his mother, Anna. Anna Thomas was a daughter of John and Eliza (Forbes) Richards. John built the Octagon House. Anna Thomas and perhaps either Sadie Jones, her nearest neighbor and Gerald Kreitzman’s grandmother, or Emma (Bott) Thomas, Billy’s wife. Note dark openings along the baseline of the Octagon where the old porches would have been connected. Can be seen: those the white stones on the right that spell out “Richards” were there in late 1920s !!! Anna Thomas, Alice Green, and who may be Luanna Richards, wife of Moses Richards. “Oh, mommy, lookit at that big, around house on that hill,” cried the little curly-haired girl as she pressed her nose against the window of a Milwaukee Road train while it slowed its pace on entering Watertown. The little child listened and stared, just as countless other little girls and grownups alike have admired it for years – the old mansion of the Hon. John Richards, Watertown pioneer, business leader and statesman. As the conductor mused – folks in Watertown don’t pay much attention to it. It’s been there so long – he probably spoke the truth, but Watertown folks are beginning to take more than casual pride over this architectural gem. 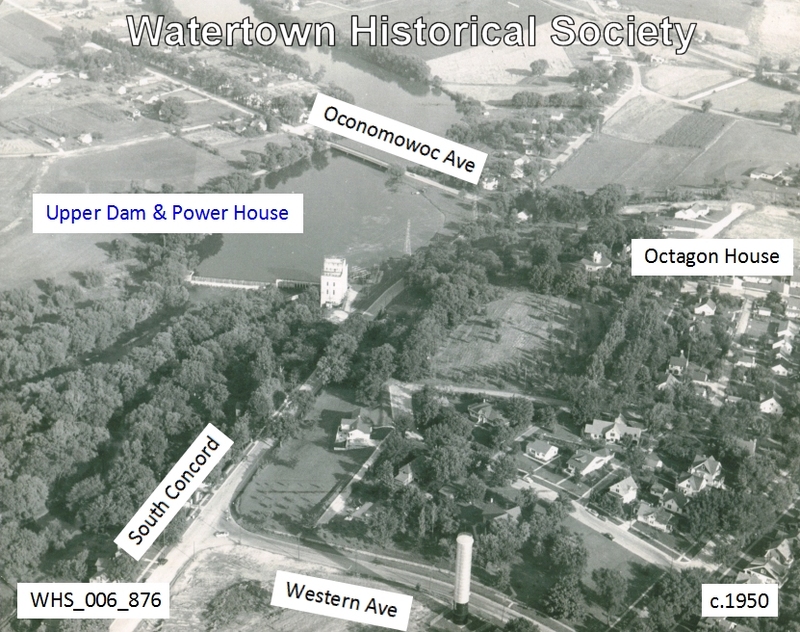 They plan to make it a museum of Watertown relics, the headquarters of the newly-organized historical society. How the association plans to accomplish its goal still is undecided, yet that is the aim. Erected on a high bluff of the roaming Rock River valley, the Richards home has seen three generations pass as it looked down like a fortress from its lofty, natural acropolis. Since 1853, for 80 years, the eight-sided brick home has housed the Richard family. Today two persons occupy the rooms which once were those of a large family, Mrs. Anna R. Thomas, daughter of the Hon. John Richards, and her son, William R. Thomas, realtor whose present ambition is to see the old homestead developed into a Watertown museum. Truly a treasure house is this old home. Many a simple bauble or home and farm implement of another day has become a relic to be cached away in this great Watertown relic that once was a shining example of domestic building grandeur. Three stories above the ground this home remains intact in all effects as it was the day on which it was built. A builder’s level proves that the structure has not sunk its well-planned foundations in its battle with the elements during those long 80 years. In all it is unchanged. No electric lights shed their twentieth century glow over the fancily-decorated rooms; no radio barks out jazz notes and oily gutturals of crooners; no roller shades to keep out the strong summer rays of the sun. Instead oil lamps, which replace their crude predecessors – candles – years ago, provide the only light after the sun had departed for the day. For music there is an old spinet-style piano in one of the parlors for those who would play on it. Old, wooden blinds cover the many windows on the structure’s eight sides. When John Richards went to build his home 80 years ago, he did so with a resolution that it should be totally apart from anything in the city. A journey to the grounds and through the home will prove to the most skeptical that he accomplished his purpose. From Milwaukee came the thousands of bricks, the real cream brick which gave the Wisconsin metropolis its nickname. With an octagon for a geometrical pattern, he selected the plans for the remarkable house which wastes not an inch of precious space. Entering from the west door a few feet from the ground, one finds himself in a parlor, oddly shaped, yet beautifully decorated in the finery of a hundred years ago. In the center of the room is a low table with the family bible standing on it. To the right are chairs and a lounge all of which have passed the century mark in age. To the left is the oblong spinet piano, the first instrument of its kind in Watertown. Piled on its closed hood are photographs, albums and trinkets, each having some honored connection either to the Richards family or to Watertown. This room Mr. Thomas plans to turn over to the historical society temporarily, so that it may preserve the other objects of interest, which it has gathered, here in one of the oldest homes in the city. A door to the right leads to a second parlor, decorated with bright wall paper and its ceiling ornate with carved moldings. Chairs, cabinets, stools and tables, all homemade of valuable woods and carefully preserved, dot the room. These, too, have stood in their places since the earliest days of the home. Their master looks with pride upon them for to him they are more than antiques. Both he and his mother have grown from childhood about them; they are relics. Overhead a fancy oil lamp of chandelier proportions hangs. Windows, with blinds turned ajar, permit the deep sunlight to filter through the finely-paned glass. Continuing the walk along the lower floor, the visitor passes through an anteroom off of the east door and finds himself in still another section of this mammoth octagon. This time it is the dining room, with chairs lining the long linen-covered table, and the buffet carefully serviced with valuable old silver and china. Paintings line the walls of this room just as they did the others, carefully hung and safely preserved. A door to the right again leads back to the first parlor where the visitor entered but a few minutes before. The trip about the lower floor is ended, the octagon has been circumscribed. In the geometric center of the house is erected a circular stairway, exactly as constructed by hand labor years ago. Its fine railing is turned perfectly and the stairs spiral their path upward to the cupola from where one can scan for miles around the countryside of Watertown – the winding river to the east, the business section to the west and the fringe of the city and the adjoining outskirts to the north and south, with the tall spires of churches piercing up from lattice of roofs that covers the vista. The second floor is given over totally to bedrooms, furnished with soft, comfortable appearing beds, carved of fine wood and finished with all the turns and curves that characterized interior decoration of generations past. Bureaus and wardrobes all are finely kept and possess the luster that the years have failed to blemish. Curiously, on the second floor the interior octagon is divided once more into a polygon of 16 sides and where, on the first floor, one room stood, here two, a large bedroom and a smaller one, complete with window and closet, take up the space. The designer of this home well knew the means of conserving space. At each landing on the spiral stairway is a small door, inside of which one will find a little faucet from which flows soft water. As the rain pours onto the tin-covered roof above it drains into a tank, well-hidden, from whence the water is fed to the series of tappets on each floor. Up the stairway once again is the third floor, all given over, except for one room, to the store space for furniture, clothing and other belongings. In the one room set aside are to be found a myriad of old treasures. Along the walls, on the floor and on the table in the center, are countless gewgaws that have played parts in the growing life of Watertown. On the floor are old trunks, good in their day, but hardly strong enough to stand the knocks of modern day rail handling. Against the wall lay oxen yokes and on the side hangs an old saddle which had been in the Richards family long before the house was erected. In one corner is a sample of Indian beadwork, brought from the then territory of Montana. Against one wall hangs maps of the United States in 1854, the western states of 1849 and Jefferson county in 1872. Quaint old etchings of such scenes as the “Fall of Richmond” in the Civil War, photographs of the home and grave of Jesse James in Missouri and pictures of early Watertown streets and people, adorn other sides of the wall. Below is a book on an antique desk used by Mr. Richards in his mill. This is the register which Mr. Thomas has started and in which tourists from coast to coast, a thousand or more of them, have inscribed their names. Along the highway, they have noticed the house, paused and found a genial host and guide in Mr. Thomas to show them about. In the center of this curio room is a table on which innumerable articles are kept. Here is a little dinner bell, set up in a fancy bronzed frame adorned with mother-of-pearl. Next to it is the bell which one day called carefree pupils to the school which John Richards built to the south of his mansion. Next to it is the chain which was among those used in surveying the strip of land for the laying of the famed Watertown Plank Road into Milwaukee years ago. Then there is a toy cannon and a mold for the manufacture of home-dipped candles. Nearby rests a candle snuffer. Most curious of all is a small bagatelle board with which Mr. Thomas said he played 60 years ago. Bagatelle is the game from which the now popular marble game developed. Nowadays it costs a nickel to send 10 or more marbles rolling around the frame, bouncing off pins and then falling into slots for a score, but this little box puts on the same entertainment for the player at no cost except the original payment. In the corner is the hand-made wooden cradle which has passed through generations in the Richards family. Mrs. Thomas, now 91 years of age, is one of the many who slept in it in their baby days. On the table is a leather pouch which another member of the family wore in the Civil War. In the pouch were carried the messages from one battalion to the other. Truly this mute piece of worn leather could tell a romantic tale if only it could speak. On a shelf is a miniature replica of the Richards home which Mr. Thomas fashioned for an exhibition years ago. The model shows the house in its original design, which a porch surrounding the entire structure on each of the three floors. This porch endured for years on the house, but the wood could not withstand rain and snow as well as its brick supports with the result that it was removed. A photographer from the National Geographical Society was in Watertown Monday, 9/9/35 and in company with Mayor W. F. Reichardt, he took several pictures of the first kindergarten. 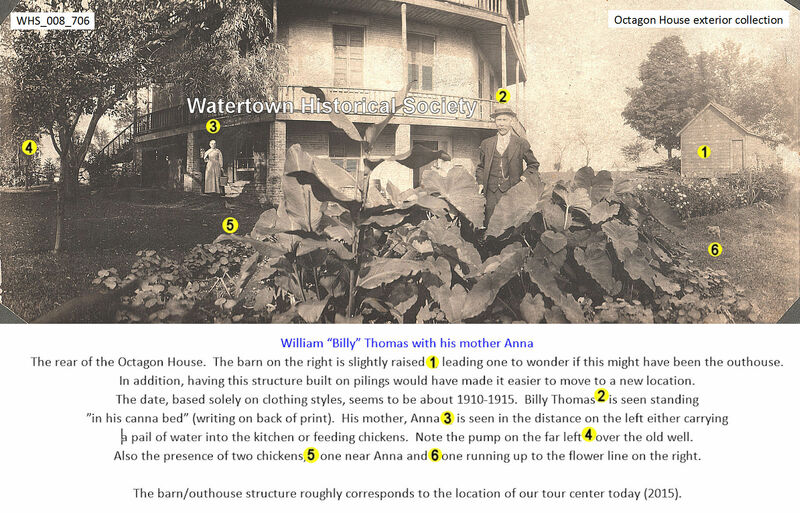 He also took a picture of the Richards home which is now occupied by Mrs. Anna Thomas. Watertown Tribune. 1940 "The Board of Directors was often plagued with the question of what constituted good repairs. Were the porches a part of that pressing need? As early as June 1940, Architect George Fred Keck offered to draw plans for the porch restoration project. A year later a five hundred dollar donation accompanied blueprints for the restoration of the verandas. These funds were made available from the Honorable Joe. E. Davies, Ambassador to Belgium and Russia." - John Richards: The Hill and The Mill, page 99. The last grandson of John Richards, builder of the Octagon House, passed away during last week. Harvey Bennett Richards, age 78, died June 10, in Ft. Myers, Fla., where he had lived for the past 20 years. He is survived by his wife, Eliza Patch Richards, a son, William D. Richards, of Winter Haven, Fla., and one daughter, Elizabeth, Mrs. George Beemer of Fort Myers, and six grandchildren. 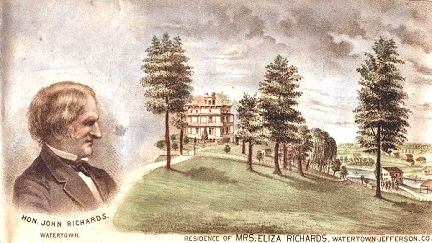 A sister, Eliza Richards Prahman, preceded him in death. 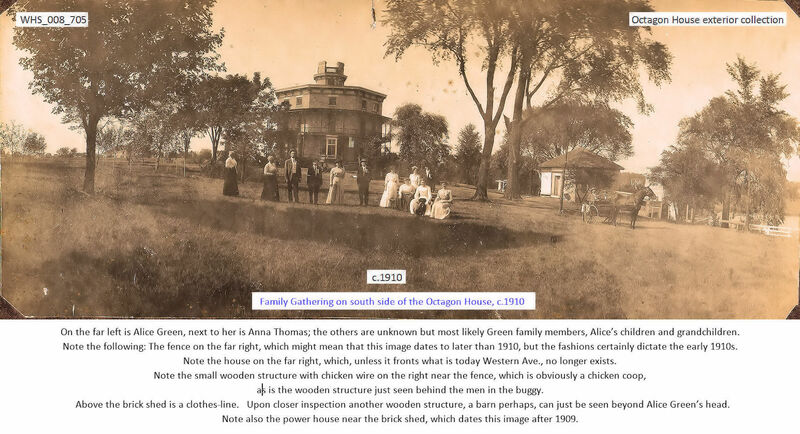 Harvey Richards' father, Charles of Chicago, the youngest son of John Richards, was the last owner of the Octagon House. After his death his widow, Estelle Bennett Richards generously deeded the house to the Watertown Historical Society at the instigation of her son, Harvey, who had been an interested and beneficent sponsor since that time. 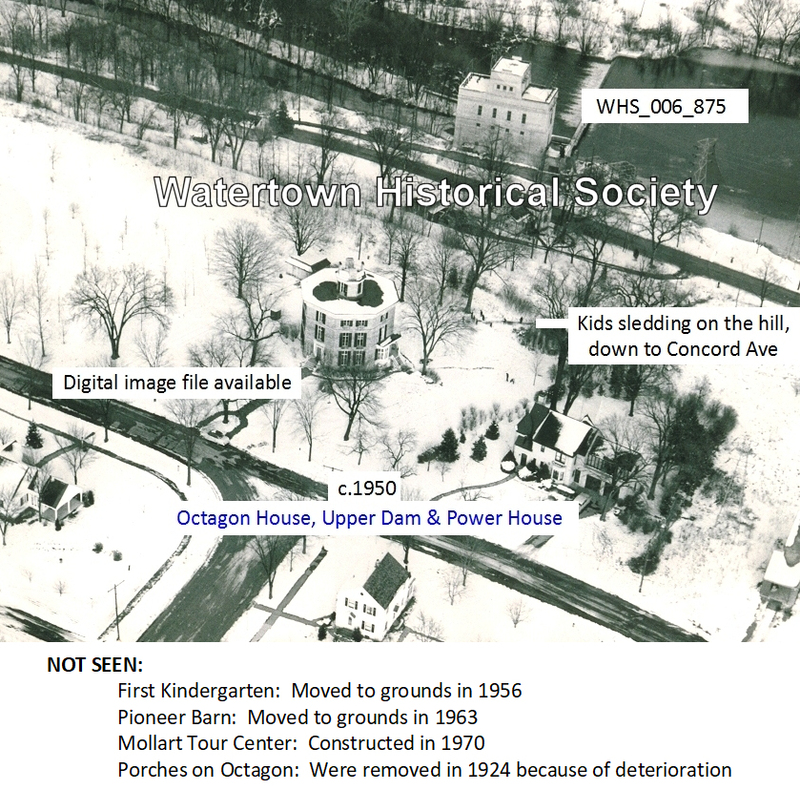 His deep concern during the years since 1939 for the success of the society, had been a great boon to the preservation and maintenance of Watertown's famous historic site. His interest and enthusiasm never failed. He was planning to come to the opening of the new tour center dedication in August, a project he heartily favored. The society has lost a devoted friend and benefactor. 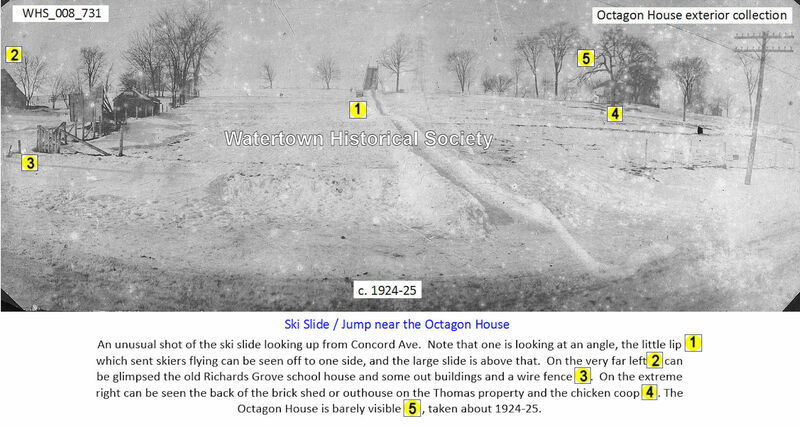 Octagon House, the beautiful home built on Richards hill in 1854, was designed, owned and lived in by Mr. and Mrs. John Richards and their descendants until 1938 when the family presented the generous gift to the Watertown Historical Society, which has owned and maintained it since that date. The Octagon House is open to the public from 10 a.m. to 5 p.m. every day, May 1 to Nov. 1, each year. 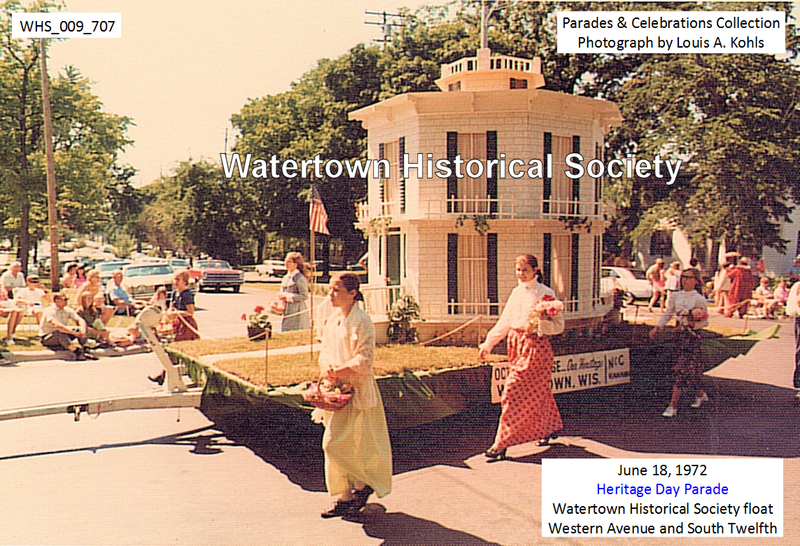 The Watertown landmark attracts thousands of visitors each season. 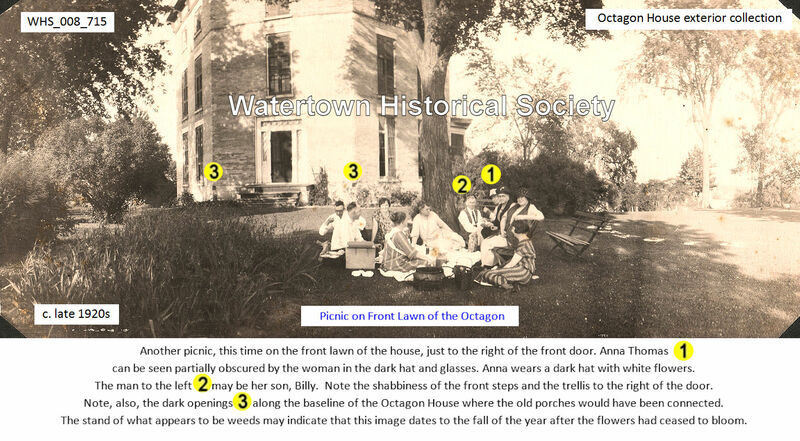 They visit and tour the Octagon House complex, then spend the rest of the day viewing Watertown’s other attractions, dining, picnicking and shopping. John Richards, a lawyer, came here from Massachusetts in 1837. He was particularly attracted to the bluffs above the river and purchased 104 acres on both sides of the Rock River. In the past he had been influenced by a new building concept — the octagon shaped house. He felt the bluffs above the navigable river would give him a commanding view of the Rock River valley for his dream home. He returned to New England for his bride, Eliza Forbes. The couple lived in a small cabin on the premises while they planned an octagon shaped home. Richards erected mills on both sides of the river. His milling operations were successful and he became very wealthy. He began building his home in 1853. It took three years to completely finish the construction. Land was cleared, sketches completed, and the building progressed with help of his mill hands. Three rounds of bricks were used in the first two levels, two rounds on the top level. 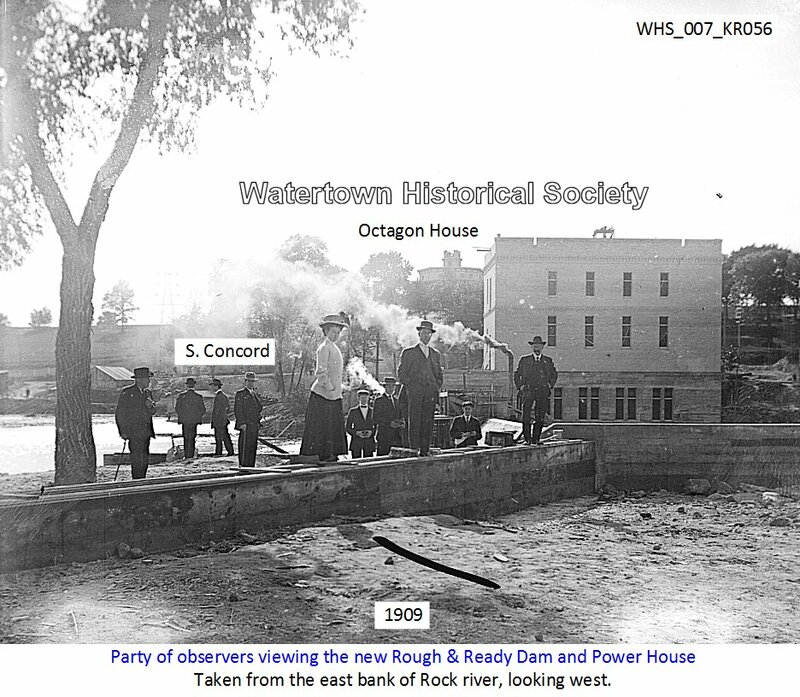 Loads of Watertown brick was used and some was purchased and brought from Milwaukee over “corduroy” roads, by ox and horse teams. Woods used in the house were from his property, oak, cherry and basswood, in almost primeval forest. tenance, “this house will stand for another hundred years without major change”. 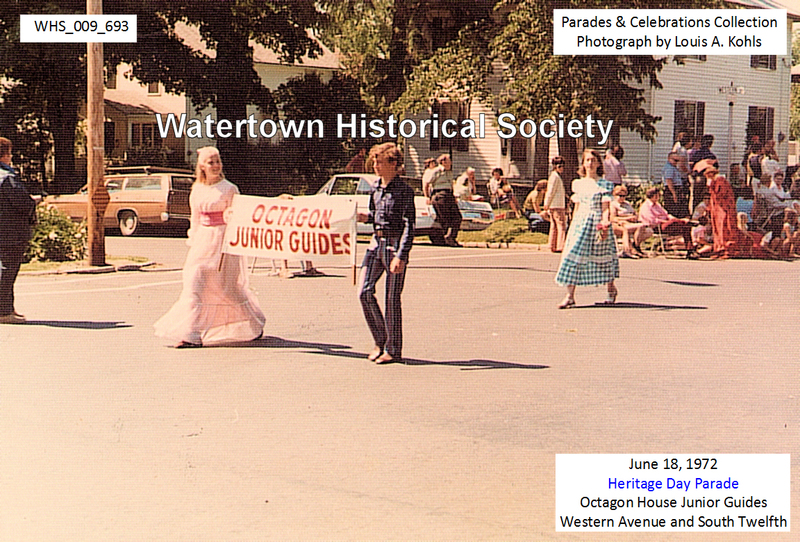 The Watertown Historical Society pondered that same question many times during its 44 years of ownership. The house needed balconies for authenticity. Gladys Mollart, for many years the curator, was a stickler for authentic furnishings in the home. 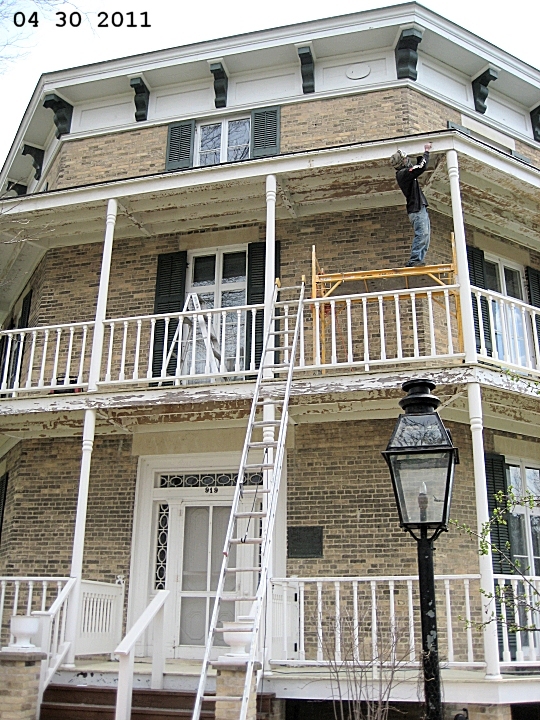 From time to time the Society considered restoring the balconies. 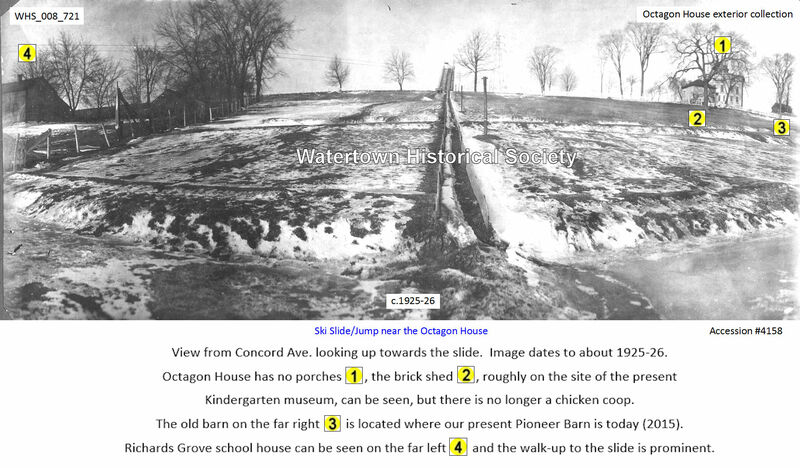 The project would be expensive and was put aside when the roof needed repairs, tuck pointing for the bricks was necessary, a kindergarten and a pioneer barn were moved to the Octagon House grounds, and a tour center was built for added space. The balconies had to wait. Now help is on the way. Two years ago, at the annual Society meeting, William Kwapil, a Society member and Rotarian, suggested that perhaps local service clubs could help with the project. A study committee from the Society board and advisory board was appointed to study the feasibility of the project at this time (David Moser, Tom Kwapil, William Schmidt, David Hertel, Charles Ebert, Gertrude Curtiss and Irene Triana). At the 1982 meeting the committee reported its findings. Society members voted to go ahead with the project. Gerald Mallach, Society president, appointed William Kwapil as chairman of a fundraising committee. In addition to Mallach and Kwapil members of this committee at the first meeting were Robert Bauch, Charles Ebert, Gerald Flynn, George Wolf, James B. Quirk, Dale Bowgren, Evelyn Rose and Neal Loeb. The contract went to Donald H. Weisensel General Contractors. The project is underway. The old footings, of large rocks and lime mortar, have been removed from 36 inches below ground. Eighteen new footings, with concrete blocks and mortar, will be spaced at 12 foot intervals around the building at a depth of 42 inches. Eighteen peirs of mortared brick will serve as supports for beams which will be attached to the brick walls with rods seven inches into the brick walls. The Somerset Door and Column Co., Somerset, Pa., is now making the posts and balusters, the same as the originals. It is interesting to note that there will be additional Watertown brick in the piers, secured from the recently razed Kellerman building on North Third Street. Weisensel is aware of the historic nature of this project and everything possible is being done in keeping with the original. The project will cost between $45,000 and $50,000. The fund raising committee hopes to raise about $30,000 of this from local sources. Several pledges have been received. 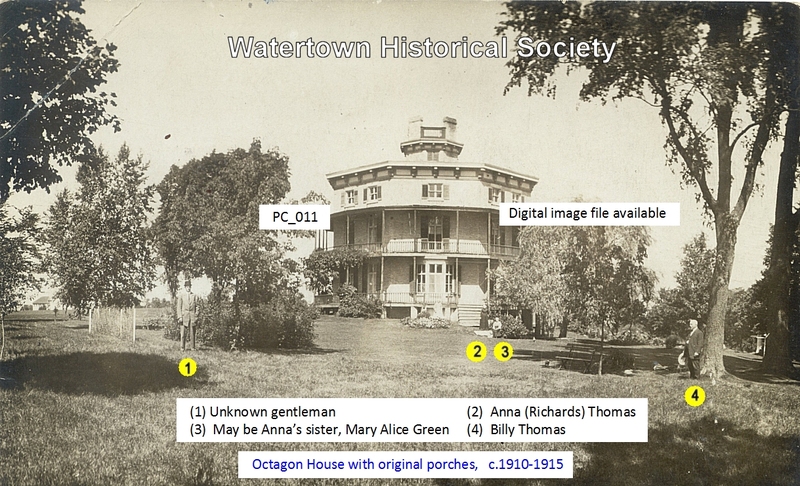 With rotting boards and posts, a recent anonymous donation to the Watertown Historical Society, allowed for the refurbishing of the characteristic porches. 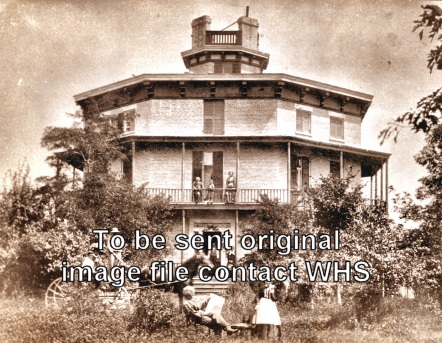 The Octagon House was originally completed with porches at its current location in 1854 by John Richards. In 1924 his daughter Anna tore down the porches because the wooden boards and beams were rotting and becoming unsafe. For almost 60 years the house sat with no porches; the only evidence of the porches was from a miniature three-dimensional model of the house. 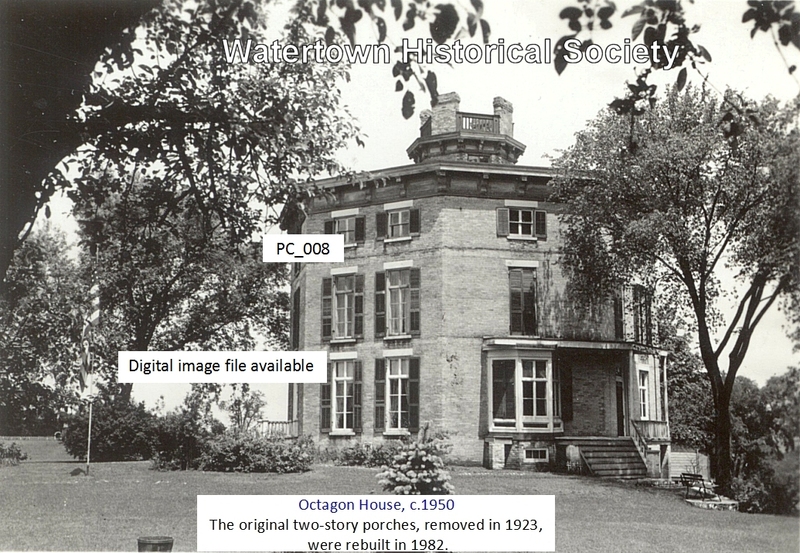 In 1938 descendants of the Richards family donated the house to the Watertown Historical Society. The five-level house was built with a number of French doors on the first and second levels that gave access to the porch. The historical society has sealed these windows and doors for heating and cooling purposes. Now the only access onto the upper level porch is from one bedroom window inside the house on the second floor. There was a tax in Watertown on the number of windows a home had, so John Richards made many of his windows into French glass doors leading out onto the porches to avoid taxing. Peter Welbourne, of Watertown, worked on the porches. He also installed various storm windows that have been made to help with insulation. Sausage makers use downtime productively. Council Proceedings: Exhibit #8502, to authorize the Street Department and Parks, Rec. 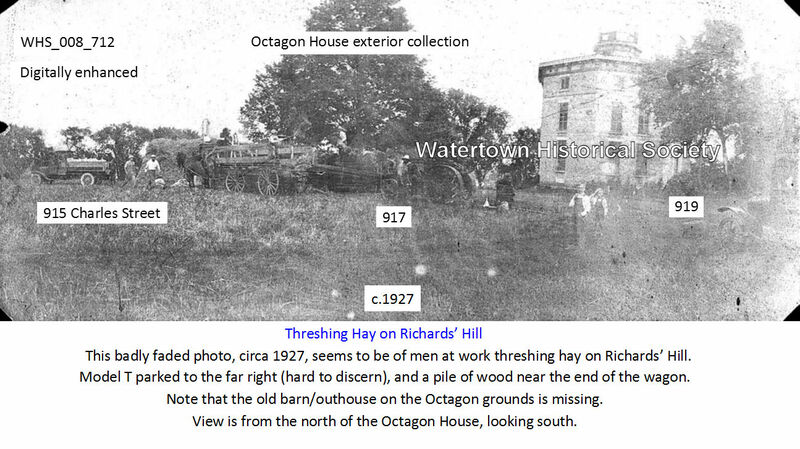 & Forestry Department to assume responsibility for lawn mowing at the Octagon House Museum at no additional cost to the Historical Society was presented. Sponsor: Mayor David. From: The Finance Committee. Alderperson Smith moved for adoption of this resolution, seconded by Alderperson Kilps and carried on a roll call vote: Yes – 8. No - none. Model of Octagon House: Its not a doll house and not a replica but rather a model inspired by Watertown’s Octagon House and built by the late Walter Reandeau, after touring the Octagon several years ago. 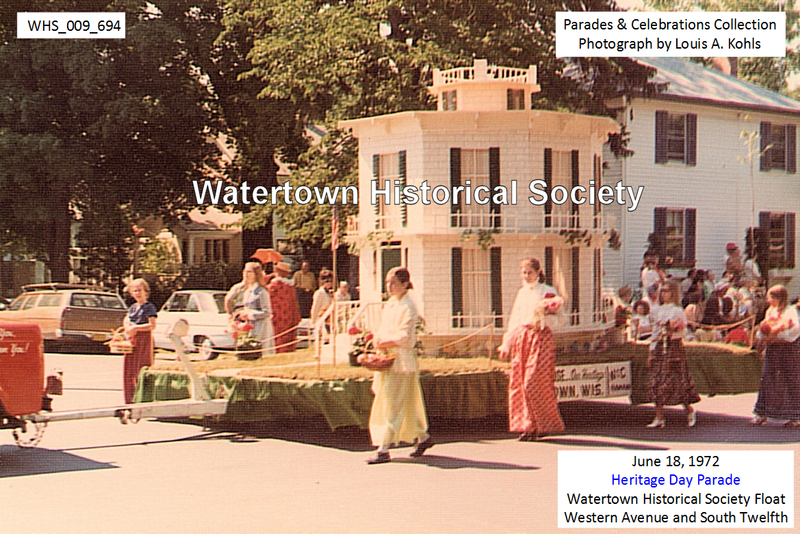 Donated by the Reandeau family to the Watertown Historical Society. Background story will be written by the daughter of Walter. Link to portfolio of 26 photos.